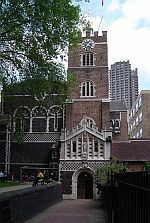 The church of St Bartholomew-the-great is one of the oldest parish churches in London and can boast some of the best Romanesque work in the capital. Building began in 1123 with the construction of the Norman chancel and apse of the church, it is the work of this period which has left the largest legacy for the building. The church is certainly a lucky survivor, it could well have been lost at the dissolution if it had not be converted into a parish church, the great fire did not travel as far north as the church and the bombs of the second world war which obliterated the nearby Barbican area and St Giles church thankfully missed much of the Smithfield area. Its survival means it is still one of the most atmospheric churches in London with a fascinating history. From 1230 the transepts and crossing were added along with a great nave. The transepts survive to this day but most of the nave was lost during the dissolution in the 16th century. After the dissolution the priory was converted into a parish church for the local area. 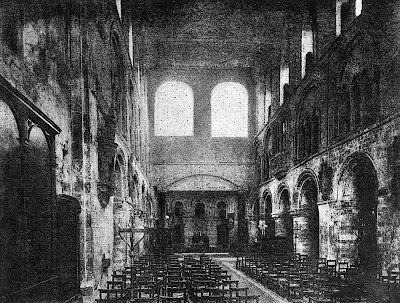 Although the great nave was lost and the transepts were exposed and degraded into a ruinous state many of the monastic buildings were not destroyed such as the lady chapel (which was turned into a private house) and much of the cloisters (of which a fragment still survives). The south end of the nave was sold to construct a private house which incorporated part of the 13th century south door in the gateway of St Bartholomew-the-Great. The area between the church and the gateway was partly used as a burial ground but was also sold for development. The current tower was added in 1638 between the north transept and the one remaining bay of the great nave as a grander entrance to the building. 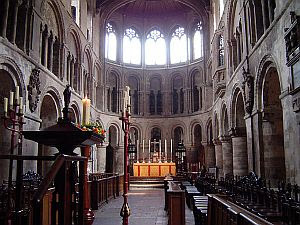 Inside the church, the apse and the chancel (shown left©) displays some of the best Norman work in London if not the south east of England. The east end of the church is most impressive due to the size and scale of the Norman work with a triforium and a clerestory (two stages respectively) above the chancel arcade which give it a sense of grandeur lacking in many of the cities medieval churches. When the triforium and the chancel arcades are viewed together they create one of the most impressive portraits of Norman architecture in the country. The east end of the church is without doubt spectacular, but the west end by the crossing, is awkward and disappointing. The destruction of the nave has given the church a strange shape with all the emphasis on the east end of the building. The church would be much more aesthetically pleasing with with the old nave rather than the bland and over sized organ which now dominants the west end. The cloister off the north transept is an interesting but unfortunately much restored fragment of the monastic past of the church (only part of one side remains). The church was restored several times during the Victorian era first in 1860 and secondly in 1886 by the architect Aston Web (who would go on to design the iconic but dull facade of Buckingham palace in 1913). Both restorations were relativity sympathetic to the church -unlike many in the city during this time. Inside the most obvious outcome of the works was the restoration of the apse which had been dissected with a flat wall at some point probably in the seventeenth or eighteenth century. The wall was removed and the original curve reinstated. Thus the restoration did make a positive contribution to the building as (I am sure most would agree) the east end is much more pleasant after the restoration. The stark contrast in appearance before and after the restoration can be seen in the two pictures above©. An external addition to the building was a new entrance porch at the base of the tower which was by Aston during his restoration. This building is of person importance to me. It was visiting this building which first gave me the inspiration to write this blog, my first post was of the gatehouse which leads into the church. This is a post I have wanted to write for some time but I hadn't got round to before as I have kept finding new fragments of the medieval city which interest me (not to say there are no more fragments of medieval London to discover, on the contrary). Before visiting the church I knew little of the medieval legacy of the city which I have cataloged in this blog, it was a genuine moment of enlightenment. Before my visit I assumed like many others that there was nothing left of the medieval city after the fire, bombing and demolition of the last 400 years or so. I hope this blog has inspired others to investigate and research the rich legacy of medieval buildings in London.